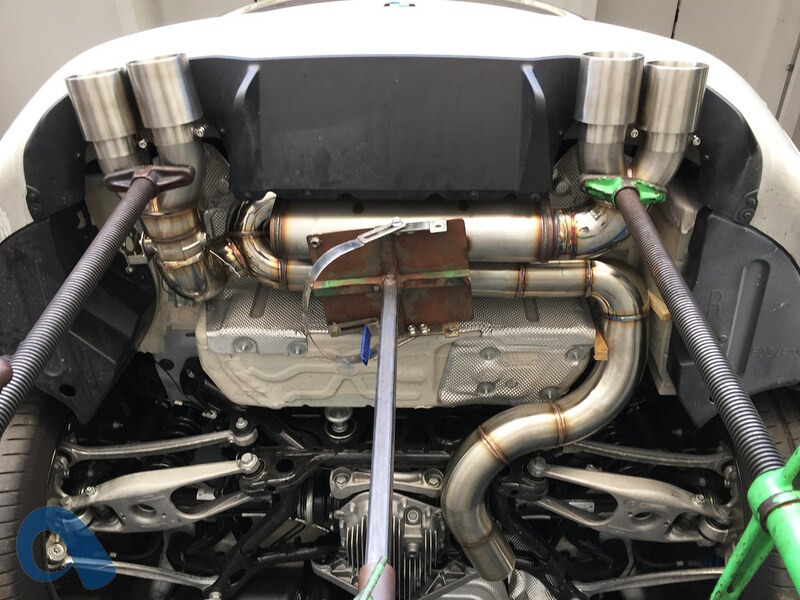 We've spent the last few weeks designing our M2 exhaust and I'm happy to say that we've begun building our prototype. We put a lot of thought in to the exhaust design and wanted to build something that would be extremely functional without sacrificing aesthetics or sound quality. As stated above, we plan to keep the OEM valve motor, but with a twist! I can't release full details yet but we will be using the valve system. We will also be seamlessly mating our exhaust to our downpipe. The exhaust diameter will not shrink below 3.5" from the turbo back! The OEM downpipe (and all other aftermarket downpipes) taper down to a ~3" diameter pipe where the stock exhaust connects. Our downpipe will be modular, and will be sold with a straight 3.5" link pipe to mate to our Signature exhaust system or with an adapter pipe to connect to the OEM exhaust system. 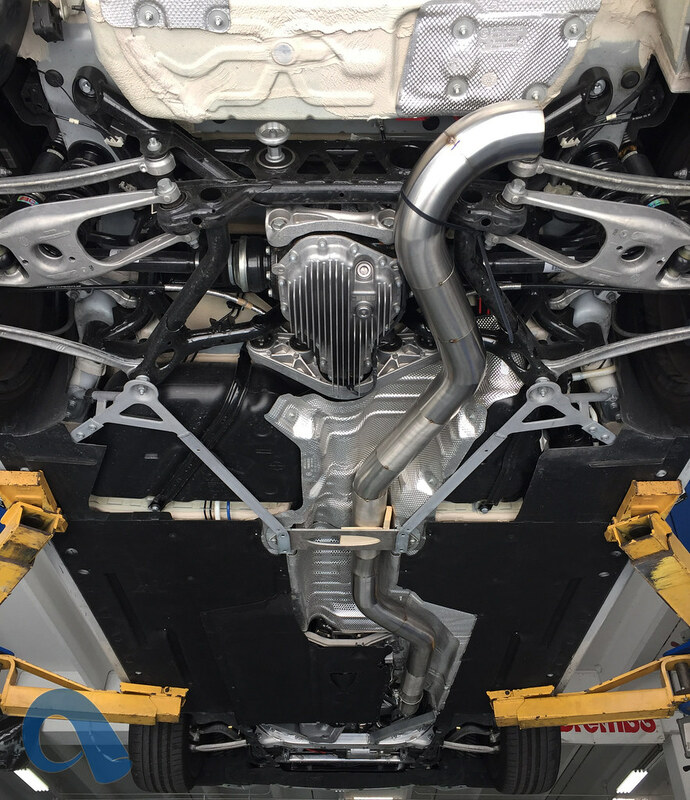 The idea is that when using our downpipe and full exhaust system, you will have a true 3.5" turbo back system with zero backpressure and high exhaust velocity! I will update this thread as we make progress on the system, and I will be glad to answer any questions as well! We are also using a true 3" valve (as opposed to the OEM 2.5") that utilizes the OEM valve motor! We've now completed 3 different variations of the rear muffler and still have not settled on a sound that we find acceptable. 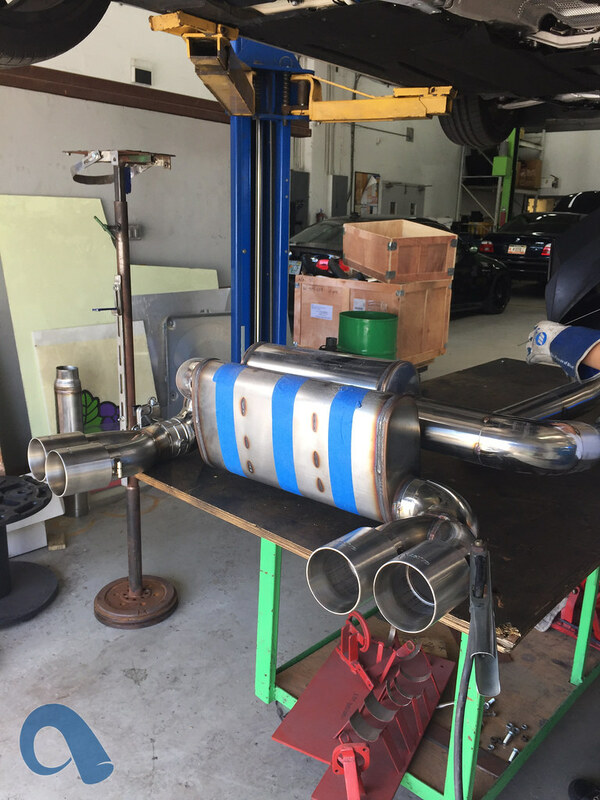 We've been playing with a few different mufflers to try and find the perfect combination so that the car is extremely aggressive with the valve open but also tame enough with the valve closed to keep your neighbors happy. Today we're trying another variation and I personally have high hopes for this setup. I'll update as soon as it's complete. Keep in mind that our car has a catless downpipe installed, but we're also considering the sound level for cars with catted downpipes. We WILL find that happy medium! Here's a couple shots of some progress. Last edited by David@ActiveAutowerke; 07-13-2016 at 09:31 AM. Will running the car with a catless downpipe without a tune be dangerous for the engine? The elimination of back pressure doesn't mess everything up? I'm scared now to run a downpipe without a tune adjusting for the difference in pressure etc it makes. Will you sell a sport-catted downpipe option that won't throw a CEL? Will the MPE CF diffuser mate with this exhaust? Absolutely not. Backpressure is not necessary on modern fuel injected engines. The ECU is these cars is extremely smart and will make adjustments to ensure that the air fuel ratio is pretty much always perfect. With the use of BMW's valvetronic technology, the ecu also opens and closes the throttle body to help control boost and it will adjust wastegate position and ignition timing to make the car run exactly how it wants it to. There is no harm in running a catless downpipe without a tune at all, the car will actually run better like that. We've always offered ceramic coating if the buyer wants it. With the valve open, our exhaust will be straight-through. We may eventually offer a catted version but nothing official yet. Our first design was admittedly too quiet. We're working on rebuilding the rear section now to be a little louder. I will post pics later today of our current setup. Original post has been updated! David, how much louder is this than stock? Also, what is the "tone" compared to stock? The OEM exhaust has a nice deep, smooth tone... will this be somewhat similar? Does the stock system have flex joint somewhere? Can't wait to see how loud it is but also hope it's quiet when valves are closed my neighborhood hated me in my 335 .. And price point would be cool this will line up perfect with VRSF catless downpipe and any new diffuser? Yes the stock system has a flex at the very front of the exhaust. It's popular to delete the flex with aftermarket BMW systems, but we are still contemplating adding one in. The main drawbrack would be reduced ground clearance, especially with our large 3.5" mid pipe design. We're back to the drawing board again. We've tried 4 different muffler combinations and it's still not 100% perfect. Our latest design was mocked up late last night and while it hasn't been finalized it's the best we've had so far. We'll be making some minor changes today that will hopefully perfect it! what about a pure straight pipe option too? We tried it. With the catless downpipe installed it's a tad too loud and not smooth sounding at all. It has a metallic and hollow sort of tone that isn't very refined. We added a very small resonator that should smooth the sound out with the valve open and will be using a straight through but effective muffler to be used when the valve is closed. Awesome yeah I love loud as can be when valves are open but closed I want semi quiet your design looks best so far I do like the MPE but I like yours if cost is lower and works well my HPF was 3.5 on my e92 loved it catless strsight pipe! We're pretty much finalized with the design, but we'll be making a few changes to the pipe routing for the production units. Sound will be the same. I really think that with our full 3.5" design and dual 3" routing to the tips along with our 3" valve (as opposed to the OEM 2.5") our exhaust will support upwards of 600whp without any restrictions. Please ignore the tip fitment, we cut and welded 6 different configurations to test sound and didn't focus on tip alignment since we weren't sure if we'd be keeping the configuration. They will fit perfectly on production units. I will also admit that the exhaust system is louder in person. It's defintely on the loud side with the valve open, and similar to the stock exhaust with catless downpipe when closed. 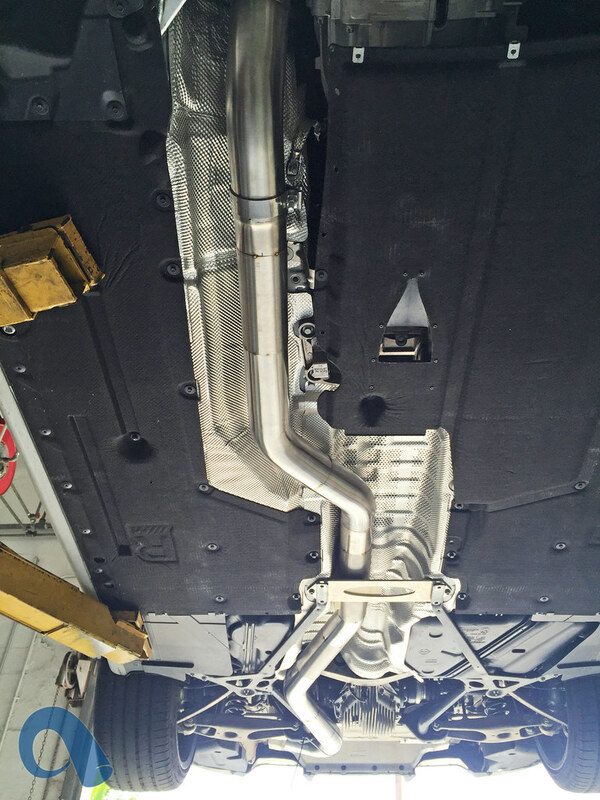 We wanted to make the system sound great with or without a catless downpipe, without being too quiet or too loud. Yes, it has our full 3.5" catless downpipe installed.